Mitt Romney pledged Tuesday to shift foreign aid toward the private sector and deprioritize humanitarian aid in favor of promoting free enterprise and business development around the world. In remarks at the Clinton Global Initiative, Romney laid out his most detailed proposals on foreign aid thus far, including his plan to move foreign aid to rely more on public-private partnerships that enlist American corporations to the cause of helping the developing world…. During the primary season, Romney joined with other Republican presidential candidates in recklessly calling for alterations to the foreign aid budget. As we wrote then, support for robust foreign aid packages has long been a key component of support for Israel. Perhaps Romney’s latest proposal to alter foreign aid is part of his pledge to “do the opposite” on Israel? Cutting foreign aid will not right our struggling economy, but will ultimately cost us more in U.S. lives and taxpayer dollars. It will surely cause direct and substantial harm to America’s national security. Further, the U.S. Global Leadership Coalition-a foreign policy organization that includes the American Israel Public Affairs Committee-strongly opposes cuts to America’s foreign assistance programs because of their potential to negatively impact American interests abroad. In making this crucial announcement today, the Obama Administration-working in close cooperation with Israel-is ensuring that Israelis will have the resources they need to defend against the deadly wave of rockets being launched into the heart of Israel from Hamas-controlled Gaza. These indiscriminate attacks against Israeli civilians-men, women and children alike-are horrific, and Iron Dome has been at the forefront of helping to protect Israelis during this deeply trying time. It was President Barack Obama’s initiative and request that brought Iron Dome into being, and funding for missile defense cooperation between Israel and the United States has more than doubled under this Administration than under the previous administration. We thank the President for his leadership on the Iron Dome — as well as key supporters of Israel and Iron Dome in Congress — for taking a firm stand to support the people of Israel. Supporting the security of the State of Israel is a top priority of President Obama and Secretary Panetta. The United States has previously provided $205 million in support of Israel’s Iron Dome short-range rocket and mortar defense system. During the rocket attacks earlier this month, the Iron Dome system played a critical role in Israel’s security. When nearly 300 rockets and mortars were fired at southern Israel, Iron Dome intercepted over 80 percent of the targets it engaged, saving many civilian lives. Iron Dome is a game changer. The threats Israel faces from incoming, indiscriminate terrorist rocket attacks are countered by this cutting edge anti-missile system. Iron Dome is fundamentally shifting political, diplomatic and military realities on the ground, while saving lives of innocent Israelis. Today’s statement is a further step in the right direction. I am pleased to see that Secretary of Defense Leon Panetta and the Obama Administration understand the importance of and remain committed to funding the life-saving rocket defense program, Iron Dome. We must continue to stand with Israel to make sure that our most important strategic ally in the region has the additional Iron Dome batteries it needs to protect its population from rocket attacks. Over the past weeks, we have once again seen the tremendous importance and effectiveness of Iron Dome that is now deployed in Israel. In the face of rockets fired by terrorists from Gaza into southern Israel, Iron Dome has been remarkably successful in saving lives and preventing all-out war. McClatchy reported today that Israel is expanding the use of the Iron Dome system and published a brief illustrated explanation of how the system works. 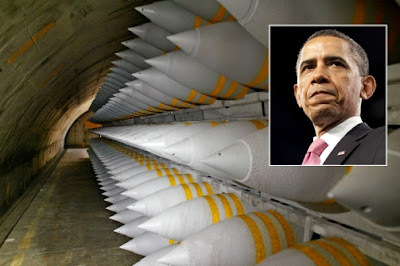 It was reported last night that President Barack Obama covertly authorized an unprecedented amount of aid to the Israeli military, including bunker-busting bombs. Just a few months after taking office, Obama authorized the delivery of 55 deep-penetrating bombs to Israel, Newsweek will detail in an article appearing on Monday. Israeli and U.S. officials told Newsweek that Israel first requested the ‘GBU-28 Hard Target Penetrators’ in 2005, but the Bush administration did not okay the deal. Then, in 2007, President George W. Bush told Israel he would order the bombs for the country and release them in 2009 or 2010. Obama delivered the weapons in 2009, the report says. While Israel had developed the capability to make its own deep-penetrating bombs, officials said, the U.S. sale was less expensive. ‘If we say yes, have we somehow given someone a green light without intending to? Whether that green light was an Israeli green light to go do something or whether it was a message to the Iranians, OK these guys aren’t serious about talking, they are starting to arm themselves,’ Cartwright told the magazine. Click here to read Weinger’s full article. The United States Congress expressed its overwhelming commitment to the Jewish State of Israel, its support for Prime Minister Benjamin Netanyahu’s efforts for peace with the Palestinians, and the strength of the U.S.-Israel relationship when they gave him numerous standing ovations and thunderous approving applause. The Prime Minister spoke eloquently of the strong security and military cooperation between the U.S. and Israel, the shared values between our two great nations, and the sacrifices that will need to be made for peace. Prime Minister Netanyahu reiterated to the world that what still stands in the way of a two state solution isn’t the specific details of the future borders of the two states as much as the steadfast refusal by the Palestinian government, since 1948, to recognize the Jewish State of Israel’s existence. As the Prime Minister said, “It is time for President Abbas to stand before his people and say… ‘I will accept a Jewish state.’ Those six words will change history. They will make clear to the Palestinians that this conflict must come to an end. That they are not building a state to continue the conflict with Israel, but to end it.” The enthusiastic applause by the U.S. Congress that welcomed these remarks reflect the vision we share with the Prime Minister on this issue. Furthermore, despite some efforts to exploit the support for the U.S.-Israel relationship for partisan gain, it has become crystal clear that President Obama and Prime Minister Netanyahu agree on one important detail to any future two state solution: a return to the 1967 lines will be indefensible for the Jewish State of Israel and hurtful to America’s interests in the region. The United States will continue to stand shoulder to shoulder with Israel in fighting terrorists and those forces seeking to destroy our democratic societies. As President Obama recently reiterated to the entire world, including the 22 Arab countries that surround Israel, the United States has an unshakable commitment to the safety and security of the Jewish State of Israel. I agree with the President that the United Nations is not the place to negotiate the final parameters of peace between the Israelis and Palestinians, and that Israel should not be forced to talk with parties, such as Hamas, that don’t recognize its right to exist and seek to drive it into the sea. We also join Israel in demanding the return of Gilad Shalit and continue the unprecedented cooperation on joint U.S.-Israel missile defense programs. Today, friends and enemies of Israel and the United States were reminded that the bond between our countries, our security interests, our values, and our people is deep and ironclad. Incitement, especially by official [Palestinian] institutions, damages the prospects of reaching a peace agreement between the Palestinians and … Israel, and only encourages terrorism. Congressman Steve Rothman (D-NJ) and Congressman Steve Austria (R-OH), both members of the House Appropriations Subcommittee on State and Foreign Operations, sent the following letter to President Barack Obama. It requests that his administration do all in its power to insist that President of the Palestinian Authority, Mahmoud Abbas, reenter peace talks, without preconditions, and demands that President Abbas eliminate all incitement against Israel and the Jewish people coming from his government, Palestinian entities, or officials. A majority of the House Appropriations Subcommittee on State and Foreign Operations and the House Foreign Affairs Committee, 39 members, signed the Rothman/Austria letter. In addition, 7 Members of Congress signed onto their letter who did not sit on either of those committees, bringing the total number of signers to 46. Full text follows the jump. We live in an increasingly complex world. Recently, we have been bombarded by news and images from around the globe about the popular uprisings in Egypt, Libya, Bahrain, and throughout the Middle East. We have seen the effects of yet another devastating earthquake, which struck Japan just weeks ago, leaving hundreds of thousands of people without homes and countless others dead. And we continue to live with the constant threat posed by North Korea’s and Iran’s pursuit of nuclear weapons as well as the danger of nuclear proliferation at the hands of terrorists. We write to request that, while all of these events are consuming the daily news coverage, we not take our eye off of working toward a goal that is close to all of our hearts: a peaceful and secure Jewish State of Israel. We are sure that you share our disappointment in President Mahmoud Abbas’s decision to withdraw from peace talks in October of last year and his stubborn refusal to reengage as a willing partner for peace with Israel. The continued intransigence of the Palestinian leadership is both hurtful to the prospect for a two-state solution and to a final resolution of the conflict that still plagues the Israeli and Palestinian people. Unfortunately, we live in a time when the Al Aqsa Martyrs Brigades will rush to take credit for the horrific, inhuman, and brutal attack in Itamar against the Fogel family, including three of their children, an 11-year-old, 4-year-old, and 3-month-old. This must serve as a wakeup call that the current state of affairs is dangerous and unacceptable. In that regard, we respectfully request that you do everything possible to urge President Abbas to root out terrorism, return to negotiations without preconditions, earnestly work toward peace with Israel, and slam the door on any effort to deal with final status issues at the United Nations. As part of that, President Abbas must fully renounce any and all Palestinian incitement against Israel and the Jewish people. On March 8, 2009, a number of us sent President Abbas a letter calling on him “to truly end anti-Israel and anti-Jewish incitement,” but clearly there needs to be further pressure. Palestinian incitement continues and there is almost no effort by them to promote coexistence and peace. We would like to bring to your attention a report recently released by Prime Minister Benjamin Netanyahu’s office entitled “Culture of Peace and Incitement Index,” that unfortunately shows that Palestinian incitement continues. Television programs run by the Palestinian Authority and textbooks in government schools continue to praise martyrdom and terrorists and call for an armed struggle against the Israelis. Incitement, especially by official institutions, damages the prospects of reaching a peace agreement between the Palestinians and America’s strategic partner and indispensible ally, the Jewish State of Israel, and only encourages terrorism. It is our hope that an independent Palestinian state can be realized, living in peace alongside the Jewish State of Israel. While the United States must not and cannot impose a solution, our country has an important role to play in encouraging the two parties to restart direct negotiations. We respectfully request that you and your administration do all in your power to insist that President Abbas reenters peace talks, without preconditions, and demand that President Abbas eliminate all vestiges of incitement coming from his government, Palestinian entities, or officials. U.S says “unwise” measure would break trust between Israeli and Palestinians. An American veto Friday defeated a United Nations Security Council resolution that condemned Israeli settlement activity as “illegal.” With only three exceptions (Eisenhower, G.H.W.Bush and G.W.Bush), American Presidents have wielded America’s veto as Israel’s last line of defense on the United Nations Security Council. U.S. Ambassador Susan Rice used the Obama administration’s first veto at the United Nations while the 14 other members of the Security Council voted in favor of the resolution. Rice said the only way to resolve the Israeli-Palestinian issue is to work toward a two-state solution. “The only way to reach that common goal is through direct negotiations between the parties with the active support of the United States and the international community,” she said. “Even the best-intentioned outsiders cannot resolve it” for them. “There simply are no shortcuts,” Rice added. See responses from Rep. Steve Rothman (D-NJ), Marc Stanley and David Harris (NJDC), and Ronald Lauder (WJC) after the jump. I commend the Obama administration for using its first veto at the United Nations to do the right thing and block today’s anti-Israel resolution. The issue of settlements needs be negotiated bilaterally, in final-status talks, between Palestinians and Israelis. It is exclusively an issue for the two parties. The adoption of this Security Council resolution would have placed the peace process in even greater jeopardy and lent credibility to illegitimate Palestinian “back door” efforts to establish a unilateral state by pre-determining the outcome of negotiations with Israel. Ongoing unilateral moves to establish a Palestinian state outside the agreed negotiation framework between the sides, based on Security Council resolution 242 of November 1967, represent a gross violation of previous signed agreements between the PA and Israel. efforts to assault Israel’s legal and diplomatic rights in ongoing negotiations over the future of the disputed territories. On behalf of the National Jewish Democratic Council, we applaud the action this afternoon of President Barack Obama and his representative, the U.S. Permanent Representative to the United Nations, Susan Rice. Once again, after days of unfortunate and unproductive speculation, our President stood alongside our democratic ally Israel in the Israel-obsessed United Nations. We know just how hard this decision was, as any outcome of a vote on this resolution is truly unfortunate – including for Israel. Permitting today’s vote against Israel to proceed, the path President Obama and his Administration wouldn’t take, was clearly, understandably and correctly not an acceptable choice for them. But today’s outcome has deeply negative fallout as well. From further isolating the United States within the Security Council to potentially further inserting anti-Israel sentiment into the awakening of democratic fervor throughout the Arab world, and in so many other ways, this vote to stand by Israel does have negative consequences. And therein lies the heart and mind of this President and this Administration. Throughout, and well beyond recent days, the President and his team have worked night and day on behalf of the critical U.S.-Israel relationship and with Israel’s needs at heart. On all sides of this complex calculus, this Administration has clearly heavily weighed Israel’s best interests. We, like all Americans who hold dear the special U.S.-Israel relationship, owe President Obama and his Administration our deep collective appreciation for his stalwart support for the State of Israel – today and always. We are watching the developing situation in Egypt with concern, and with hope. We agree with President Obama that it is essential that the Egyptian government use restraint when dealing with peaceful protests. Our prayers go out to all those who have been injured and the families of those who have been killed in this conflict. The people of Egypt should have the rights of all citizens of the earth to peacefully assemble, to express their opinion openly and without fear of oppression, and to express their political desires through a fair and legitimate election. We, therefore, join with the governments of the United States and Canada in calling for President Mubarak to implement the political, social, and economic reforms that will move the country forward. We urge, and pray, that these reforms be moved forward through a peaceful dialogue between the protestors and the government and not through the use of violence on either side. The United States and our allies are all monitoring the situation on a minute by minute basis and encourage a peaceful and democratic resolution to the current Egyptian unrest. My heart goes out to all of those who have been killed or injured during the mass demonstrations in the Egyptian streets. For the past 30 years, as the most populous of the Arab states, with the largest standing army in the region, Egypt has played a critically important role in protecting America’s interests in North Africa and the Middle East. This includes Egypt’s cooperation in military, intelligence, and economic matters with our country; and its continuing to preserve the peace with America’s most important friend and strategic ally in the region, the Jewish State of Israel. Egypt has also partnered with the U.S., Israel, and our other allies in fighting terrorism. In the end, we seek an Egypt that remains a strong ally, working with the U.S. in our common fight against terrorism, living at peace with Israel, and creating an increasingly open society to meet the needs of its young and growing population. The uprising in Egypt that looks like it may sweep away President Hosni Mubarak’s 30-year-old regime threatens to deprive Israel of its most important strategic ally in the region. Israeli leaders have been silent about the events in Egypt and are powerless to affect the outcome. But they and the entire Israeli population are gravely concerned that the turmoil will ultimately bring to power a new government hostile to the Jewish state. At a time when Israel’s relations with Turkey, its other traditional regional ally, have deteriorated sharply, and when Hezbollah is strengthening its grip in Lebanon, the developments in Egypt will likely deepen a sense of vulnerability in the Israeli public and strengthen the government’s determination to keep security its number one priority. There is also the danger of a domino effect. Challenges have been sparked to the monarchy in Jordan – the only other Arab country to have made peace with Israel – as well as governments throughout the Arabian Peninsula which control most of the world’s oil supplies. Israel and Egypt fought four wars between 1948 and 1973 but signed a peace treaty in 1979. True, it was a “cold peace.” Mubarak refused to allow cultural or people-to-people relations to flourish and kept military ties between the Israel Defense Forces and the Egyptian military on a low level with no joint exercises. He also tolerated a media that has spewed offensive anti-Semitic and anti-Israeli rhetoric for years, ensuring that Egyptian public opinion remained hostile to Israel and Jews in general. Still, this “cold peace” has been a tremendous strategic asset for both countries and a bulwark of stability in the region. Israel no longer had to plan for a two or three-front war and was able to cut military spending, with a consequent boost to its economy. In the past year, the Egyptian military has made some efforts to disrupt weapons smuggling to Iranian-backed Hamas across its border with Gaza. Of course, Israelis recognize that Mubarak has been running a corrupt, authoritarian regime that has held back progress in his country. On a strictly human level, Israelis understand that Egyptians should enjoy the same democratic rights as they do and deserve the chance to build a better future. But the danger exists that what comes next will be infinitely worse, not only for Israel but for the Egyptian people themselves. The nightmare scenario, of course, is a repeat of the Iranian revolution of 1979 when the pro-western Shah, an Israeli ally and oil supplier, was replaced by an Islamic regime that openly calls for Israel’s destruction, denies the Holocaust and is engaged in an all-out attempt to build nuclear weapons. The Shah’s government, no doubt, was a cruel human rights abuser – but the Islamic fundamentalism of the Ayatollahs which replaced him has been a thousand times worse and now threatens the peace of the world. In Egypt, the best opposition organization is the Muslim Brotherhood which has close links to Hamas and is ideologically very hostile to Israel. Its leaders probably understand that abandoning the peace treaty with Israel would endanger the $2 billion in aid Egypt receives each year from the United States as well as critically damaging Egypt’s important tourist trade. But their rank-and-file supporters are not as sophisticated and would no doubt place immense pressure on the leadership to change the country’s pro-western orientation. Still, Egypt is no Iran. Strategically and historically, the two are competitors and not allies. Iran is at the center of a growing “Shi’ite crescent” which is steadily bringing Lebanon into its orbit. Probably the best solution for Egypt would be a peaceful and orderly transition to free and fair elections. But this too is no panacea. Local elections were held in Gaza in January 2005 which brought the Iranian-backed Islamic fundamentalist Hamas movement to power. That was six years ago, and Hamas seems determined never to hold another election ever again. In 2007, it brutally crushed the opposition Fatah organization and expelled its members. Last October, a poll by The Israel Project in Gaza found Hamas with only a 40 percent approval rating, trailing considerably behind Fatah – but of course Gazans have no opportunity to express their will at the ballot box. Egyptians deserve a chance to build democracy and move their country forward. Israelis hope they get the chance to do so, knowing that peace and friendship works best between fellow democracies. This funding sends a strong message, to both our enemies and allies, by providing more total dollars than ever before toward these rocket and missile defense programs. This is only the latest example that when it comes to defense, military, and intelligence cooperation, the relationship between the U.S. and Israel has never been stronger.